Amazon is running a promotion to get Prime members to download and sign-in to its mobile app for the first time. The incentive is the generous sum of $10. Amazon has previously said Prime members spend more than non-Prime members, and this promotion indicates Prime members are inclined to spend even more when they use its mobile app. 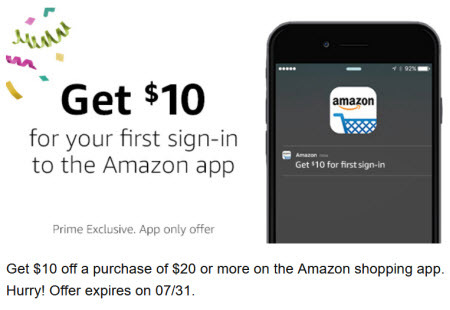 Note that the $10 bounty can only be applied to purchases made through the Amazon mobile app and expires on August 31, 2018. Nor can it be applied to digital content or Amazon Gift Cards. See more information on this Amazon landing page.